Studies of DNA repair and the maintenance of genomic integrity are essential to understanding the etiology and pathology of cancer. The availability of the complete genome sequence of Saccharomyces cerevissiae has greatly facilitated the discovery of new genes important for DNA repair. Crucial biological processes tend to show a high degree of evolutionary conservation, from unicellular organisms through to multicellular ones. Thus, it is possible to understand the basics of important pathways in complex organisms by studying simple organisms. In no case has this been more evident than in the studies of DNA repair in the budding yeast, Saccharomyces cerevisiae. Many of the genes involved in various aspects of DNA repair were first identified and characterized in yeast [1,2], and completion of the (draft) human and yeast genomes now presents us with the exciting possibility of discovering further genes that underpin DNA repair, which might be relevant to the pathology of cancer. A number of genome-wide studies have already been possible because the complete sequence of the budding yeast genome is available: for example, genome-wide expression analysis in response to DNA-damaging agents and to other environmental perturbations [3,4,5]. The completion of the yeast genome has also made it possible for the researchers working on the Yeast Genome Deletion Project to create comprehensive sets of isogenic haploid and diploid strains carrying deletions of essential and non-essential genes . Recently, Michael Resnick and colleagues  used these deletion sets to identify genes that are associated with tolerance to ionizing radiation damage. Using similar deletion sets in a genome-wide microarray-based genetic screen, Jef Boeke and colleagues  identified genes involved in the non-homologous end-joining (NHEJ) pathway of DNA double-strand break (DSB) repair. This study and the implications of its findings are the main focus of this article. Breaks in both strands of DNA are the major cytotoxic lesions caused by ionizing radiation. These lesions are highly recombinogenic and can thus lead to chromosomal translocations and, ultimately, the development of cancer. They are also very toxic - a single DSB can lead to apoptosis . It therefore comes as no surprise that eukaryotic cells have evolved elaborate mechanisms to deal with this type of DNA damage. There are two main pathways for the repair of DSBs: homologous recombination and non-homologous end-joining (NHEJ). 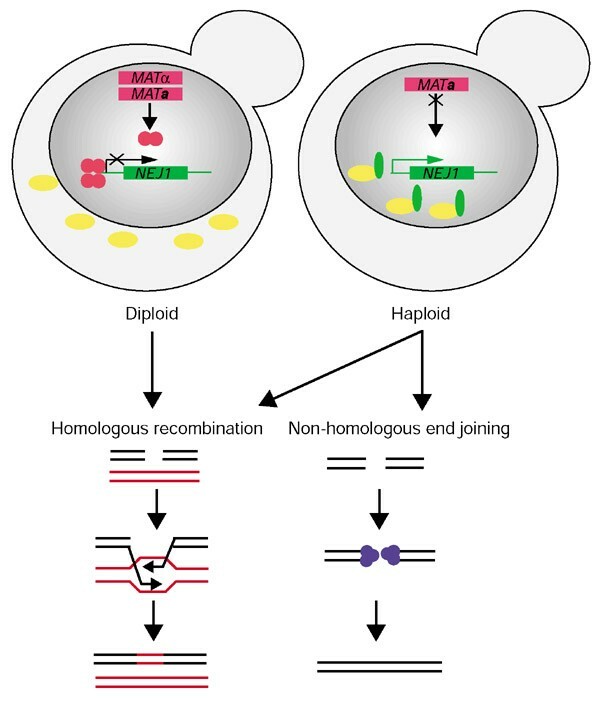 Whereas homologous recombination relies on extensive sequence homology between the damaged DNA and an undamaged partner DNA molecule, NHEJ does not need an undamaged partner and instead results in the two broken DNA ends being religated directly. The first insights into the mechanism of NHEJ came from analysis of radiosensitive mammalian cell lines deficient in this process [10,11,12]. Identification of genes mutated in these cell lines revealed that the DNA-dependent protein kinase (DNA-PK) complex is pivotal to NHEJ [13,14]. The catalytic subunit of this complex, DNA-PKcs, is a serine/threonine kinase and a member of the phosphatidylinositol 3-kinase-like family. The complex also contains two other subunits, Ku70 and Ku80, which form a heterodimer that has affinity for double-strand ends of DNA . It appears that DNA-PKcs is recruited to DSBs by the Ku heterodimer, and that this results in the activation of its kinase activity and thus phosphorylation of downstream targets. This, in turn, potentiates the repair process . One downstream target of DNA-PKcs is the XRCC4 protein, which forms a complex with DNA ligase IV, the ligase specific for the NHEJ pathway [15,16]. XRCC4 stabilizes and stimulates the catalytic activity of DNA ligase IV . The MRE11/RAD50/NBS1 protein complex has also been implicated in NHEJ, and it has been postulated that the nuclease activity of MRE11 is used to process DNA ends before ligation takes place . Recently, de Villartay and colleagues  identified a new human NHEJ component by studying cells from a subgroup of patients with severe combined immunodeficiency who were also radiosensitive. This protein, named Artemis, is a member of the metallo-β-lactamase superfamily; its precise function in NHEJ remains to be elucidated. The NHEJ pathway in yeast is very similar to that of mammalian cells but with important differences. Whereas budding yeast has homologs of the two mammalian Ku subunits, it appears to lack a DNA-PKcs homolog [19,20]. Also, there does not seem to be a clear homolog of Artemis . Yeast cells do have Mre11p/Rad50p/Xrs2p and Lig4p/Lif1p complexes, however, and these are functional homologs of the mammalian MRE11/RAD50/NBS1 and ligase IV/XRCC4 complexes, respectively [19,20]. In contrast to higher eukaryotes, budding yeast relies more on homologous recombination than on NHEJ to deal with DSBs. Consequently, deletion of yeast NHEJ genes in the presence of a functional homologous recombination pathway does not lead to a readily measurable change in sensitivity to DNA-damaging agents . This 'masking' of defects in NHEJ by homologous recombination activity means that it is not easy to perform a conventional genetic screen in yeast to identify new NHEJ factors. Boeke and colleagues  have recently used an elegant system to overcome this problem, taking advantage of a special collection of yeast deletion mutants. In this collection, over 5,800 of the estimated 6,000 yeast open reading frames (ORFs) have been systematically disrupted. In each mutant, the complete ORF has been replaced by a KanMX cassette, which results in resistance to the antibiotic G418. Furthermore, each cassette is distinctly marked by a special 'barcode' consisting of two 20-nucleotide sequences flanking the KanMX gene. These are referred to as UPTAGs and DOWNTAGs and are themselves flanked by universal priming sites. The two tags can be used as hybridization probes to detect the presence of each mutant in a mixed population of mutants (Figure 1) . The microarray screen performed by Ooi et al. . The S. cerevisiae-Escherichia coli shuttle plasmids pRS416 are linearized with the restriction endonuclease EcoRI. The mutant pools are transformed in parallel with circular and linearized pRS416 plasmids and the transformants selected by plating on synthetic complete medium without uracil (SC-URA). Mutants with wild-type NHEJ activity (Mutant 1, blue) will be able to repair the linearized plasmid and grow to levels similar to those of the same Mutant 1 transformed with circular plasmid. In contrast, mutants deficient in NHEJ (Mutant 2, pink) will die on SC-URA plates because they fail to recircularize the plasmid. 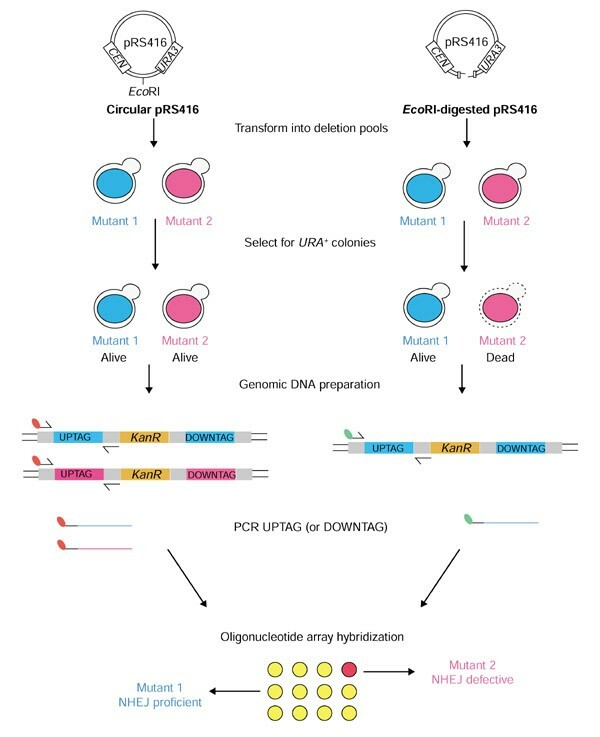 As each deletion is flanked with UPTAG and DOWNTAG as well as universal priming sites (gray boxes), PCR can be used to amplify the UPTAGs (or DOWNTAGs) using labeled primers to the universal sites; Cy5-(red) labeled primers were used for DNA prepared from circular pRS416 transformants, whereas for linearized pRS416 transformants Cy3-(green) labeled primers were used. The fluorescently labeled PCR products were used as probes for hybridization to a DNA microarray bearing each tag in triplicate; if both are present (Mutant 1) the array appears yellow, but mutants deficient in NHEJ (Mutant 2) would be under-represented after selection on SC-URA plates and therefore the Cy3 signal will be reduced and it will appear as red. In the paper by Ooi et al. , this technology is used to identify new factors in the NHEJ pathway. They took advantage of an assay in which yeast has to repair a DSB using NHEJ, despite the presence of a functional homologous recombination pathway. Thus, mutations in genes involved in NHEJ result in a measurable defect in DNA repair and the aforementioned 'masking' problem is avoided. The assay is an in vivo plasmid repair assay, in which a DSB is generated within a region of a plasmid that is not homologous to chromosomal sequences; thus homologous recombination cannot be used to repair this DSB. Yeast cells transformed with this plasmid in either linearized or supercoiled form are grown and counted in parallel (to account for differences in transformation efficiencies) on selective medium. The linearized plasmids can be maintained in yeast only after they have been recircularized and ligated, so, the efficiency of transformation with linearized plasmid, normalized to that of super-coiled plasmid, provides a quantitative readout of DSB repair via the NHEJ pathway. Ooi et al. carried out this plasmid repair assay on pools of mutant haploid and homozygous diploid yeasts. Separate green- and red-labeled probes, derived from the linear and circular plasmid transformations, respectively, were hybridized to oligonucleotide arrays (Figure 1; further details of the method are in the figure legend). NHEJ defective mutants can bind only one of the probes - the red one - and so produce a red signal while the rest of the array is yellow. Because the barcodes are unique to each mutant, the NHEJ mutants could be easily identified. Indeed, in this way Ooi et al. identified most of the known NHEJ genes, providing a clear 'proof of principle' for their method. A number of additional genes were shown to be important for NHEJ, but, for most of these ORFs, it is not immediately evident how they might function in the NHEJ pathway. One ORF discovered in this way, however, designated as YLR265C or NEJ1, was known to code for a protein previously shown to interact with the Lif1p component of the Lig4 complex in a high-throughput two-hybrid study . Ooi et al. show in their paper that deletion of this ORF results in a defect in NHEJ and confirm that Nej1p interacts with the amino terminus of Lif1p in a two-hybrid assay. Although Ooi et al. do not suggest a mechanism of action for Nej1p, other groups who independently identified NEJ1 go some way towards providing a possible mechanism of action [24,25,26]. It seems that Nej1p is involved in regulation of NHEJ in a cell-type-dependent manner. Thus, in the diploid state, where a haploid yeast cell can potentially use error-free homologous recombination at all stages of the cell cycle, the NHEJ machinery is down-regulated through suppression of Nej1p expression. This is achieved by the Mata1-Matα2 transcriptional repressor, which is expressed only in diploid cells and switches off haploid-specific genes . It turns out that NEJ1 is one of the targets of Mata1-Matα2 suppression [24,25,26]. When NEJ1 expression is repressed in diploid cells, this appears to result in the loss of nuclear localization of Lig4p . In this way, budding yeast has evolved an elegant system to favor the repair of DSBs by homologous recombination in diploid cells by repressing the expression of a subunit of the DNA Lig4 complex (Figure 2). Given that NHEJ plays a particularly crucial role during G1 phase of a haploid cell cycle, when there are no homologous sequences available , it will be interesting to see whether Nej1p is also regulated during different stages of the cell cycle. A possible mechanism for the role of Nej1p in NHEJ. In diploid cells, expression of the Mata1-Matα2 repressor (red circles) results in transcriptional repression of NEJ1. This, in turn, causes a loss of the nuclear localization of Lif1p (yellow), thus disabling the Lig4 complex. In contrast, haploid cells express Nej1p (green), which facilitates the transport of Lif1p into the nucleus where it forms the Lig4 complex, enabling the cell to carry out NHEJ. In the lower diagrams the proteins involved in NHEJ are in blue; see text for more details. The 'post-genomic' screening strategy used by Ooi et al. has clearly demonstrated its utility in identifying genes that it would have been difficult to discover with conventional genetic screens. This work, coupled with the work of the other groups that identified Nej1p by complementary approaches, has shed important new light on the control of NHEJ. Nevertheless, there are a number of reasons to speculate that additional NHEJ genes may still await identification. First, the screen used by Ooi et al. is at present suited only to non-essential genes, meaning that it would not identify genes that are required for NHEJ but which are also needed for essential cellular processes. Second, the screen will not detect 'redundant' genes whose products functionally overlap with other proteins in NHEJ. Third, unlike the 'clean' DSBs generated by restriction enzymes, DSBs induced by ionizing radiation frequently also bear base damage. There might, therefore, be genes that are required to repair radiation-induced DSBs that were not picked up by the restriction-enzyme-based screen. Fourth, the chromatin state of the plasmid used in the screen may be different from that of chromosomes, meaning that NHEJ of chromosomal damage might rely on additional factors not needed in the plasmid system. Further refinements of the screening strategy and work using complementary approaches will be needed to see whether such additional NHEJ genes do indeed exist. Finally, it is worth noting that, although most DSBs in mammalian cells are repaired predominantly by NHEJ, the homologous recombination pathway also plays a crucial role, particularly in the S and G2 phases of the cell cycle . One possibility is that the choice between the two DSB repair systems in mammals might also be regulated, at least in part, by modulating the activity of the ligase IV-XRCC4 complex. Could this modulation be mediated by a Nej1p-like factor? Database searches have so far failed to identify homologs of Nej1p in other organisms at the sequence level but the low level of primary sequence conservation between other NHEJ factors - such as Lif1p and XRCC4 - indicates that there might be a functional counterpart of Nej1p with a dissimilar sequence - as yet undetected - in mammals. We thank Jane Bradbury for critically reading the manuscript. A.J. is supported by a grant from Cancer Research UK.